Carnivorous plant, rhizomatous perennial with leaves modified to form trumpet-shaped tubes that trap insects. 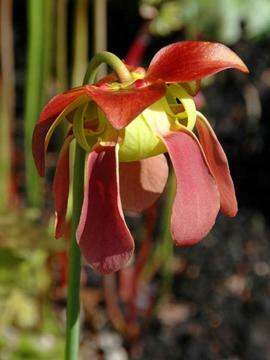 Relatively short growing with long lasting pitchers that hold liquid in which insects are digested. They have hood-like upright lids and range in colour from yellow-green to deeply red or purple flushed, often with conspicuous dark red-purple veins. Also produces some flat undulating normal leaves. The large spring flowers are normally dusky red. Needs consistently wet or boggy, lime-free soil, which is low in nutriants. Full sun in a sheltered position. Prefers warm conditions in summer and will survive periods below freezing in winter, though cultivated plants are often overwintered in a glasshouse or similar. From seed, but can be very slow to germinate, or by division of offsets. Native to eastern parts of the USA, this subspecies being found further south than the species.